These photos prove that love is colorblind. 1. You can’t help but be inspired when you see this beautiful couple. Pay no attention to the coleslaw. 2. Does the man have coleslaw on his shoulder? Yes. Does it make this any less beautiful. Not at all. 3. Fifty years ago, society may have judged their relationship. Don’t let coleslaw distract you from the progress we’ve made. 4. Racism isn’t over. 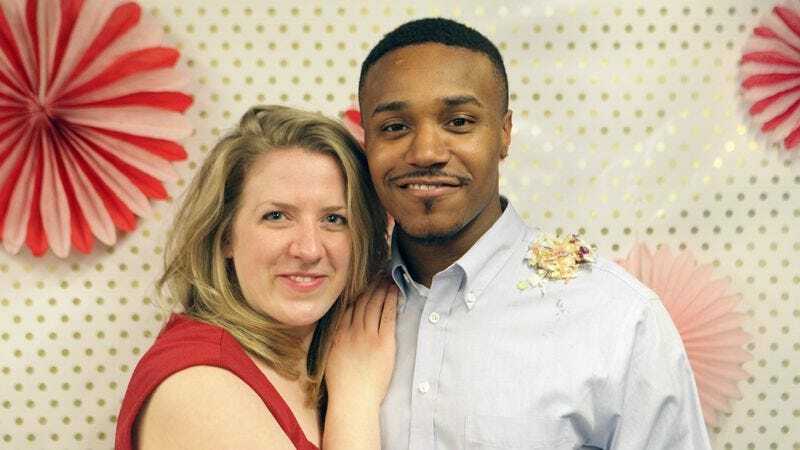 But couples like this one show us that we don’t need to see race. We don’t need to see coleslaw. 5. Who cares why he has coleslaw on his shoulder? These two people are soulmates—that’s what’s important. 6. Skin color doesn’t matter. The coleslaw doesn’t matter. 7. Would these photos be better without the coleslaw? Maybe. Nobody is saying that the coleslaw is improving these photos. 8. This couple is adorable no matter how much pickled cabbage you dump on top of them.